of slender tapered ovoid form with high rounded shoulders, short neck and wide trumpet mouth, applied with a triple-strand handle tied with a band at the top and with a stud at the join to the shoulder, the short spout rising at a sharp angle on the shoulder opposite the handle, covered inside and out with a translucent glaze of very pale bluish tint and with a softly matte surface, gathering in pale ‘tears’ low on the sides, the flat base with slightly splayed sides, the underside unglazed revealing the fine white porcelain body. A very similar ewer excavated in 1965 from the site of Dingyao kilns at Xucheng, Quyang county, Hebei province and now in the collection of the Hebei Institute of Cultural Relics, is illustrated in Dingci yishu (The Art of Ding Porcelain), Shijiazhuang, Hebei, 2002, p. 47, fig. 54. Compare also the white porcelain ewer of very similar form, formerly in the collection of Carl Kempe, Ekolsund, Sweden, illustrated by Gyllensvärd in Chinese Ceramics in the Carl Kempe Collection, Stockholm, 1964, pp. 100-101, no. 286. The same ewer was exhibited in Venice and illustrated in the catalogue, Mostra d’Arte Cinese (Exhibition of Chinese Art), Palazzo Ducale, Venice, 1954, no. 364. 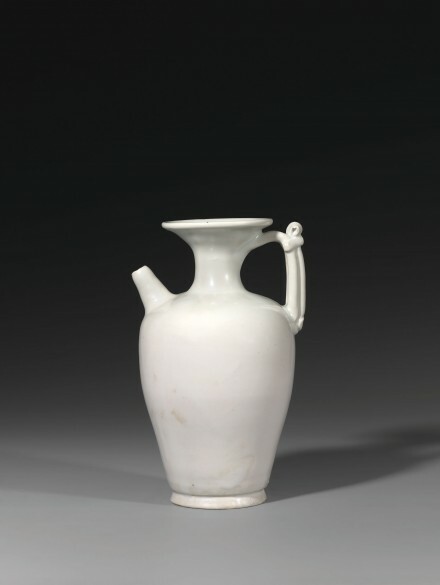 Another very similar white porcelain ewer in the Tokyo National Museum is published in Illustrated Catalogues of Tokyo National Museum: Chinese Ceramics, Vol. I, Tokyo, 1988, p. 81, no. 315; one other similar Tang white porcelain ewer is illustrated by Mino, Pre-Sung Dynasty Chinese Stonewares in the Royal Ontario Museum, Toronto, 1974, pl. 66; and another smaller example from the collection of Major General Sir Neill Malcolm was included in the International Exhibition of Chinese Art at the Royal Academy of Arts, London, 1935-36, no. 990.